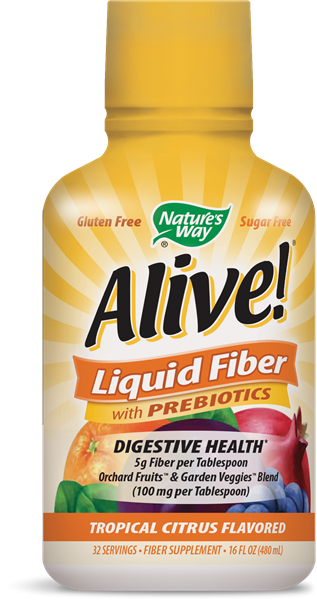 Alive!® Liquid Fiber Citrus 16 ounce - Nature's Way®. Shake well before use. For 5 grams of fiber take 1 Tablespoon (0.5 fl oz or 15 mL). For 10 grams of fiber take 2 Tablespoons (1 fl oz or 30 mL). May be taken up to two times per day. Formulated for adults and children 12 years of age and older. If you are pregnant, nursing, or taking any medications, consult a healthcare professional before use. NutraFlora® is a registered trademarks of Ingredion.